The Appalachian Trail is the most famous hiking trail in the U.S., extending 2,189 miles from Georgia to Maine. 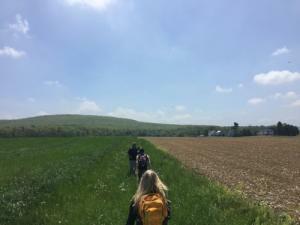 46 miles of the Appalachian Trail meanders through Cumberland Valley Pennsylvania, including a 13-mile section that is the longest, lowest and flattest section on the entire trail and one of the most accessible portions to park and take a short day trip. 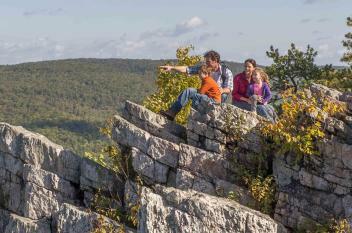 Find more info below about hiking options along the Appalachian Trail. Park at Scott Farm Appalachian Trail Work Center. Scott Farm is the headquarters for A.T. trail maintenance activity for the Mid-Atlantic Appalachian Trail Conservancy, as well as one of the maintaining clubs, Cumberland Valley Appalachian Trail Club. A water spigot and portable toilet is available during spring, summer and fall. Trail information can be found at the bulletin board and in a box on the side of the barn. Cross the bridge on the pedestrian walkway, heading southbound on the A.T. Continue left into the woods along a wooden boardwalk constructed in 2005 to keep the trail above swampy land along the beautiful Conodoguinet Creek. 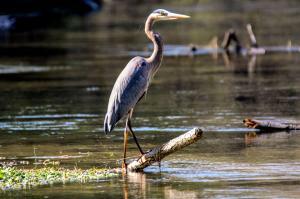 You may see herons and other water birds. If you are more ambitious, continue through woodlots and farm fields and across three major highways. Turn around and hike back to your car. Boiling Springs is famous for its springs, the beautiful Children&apos;s Lake in the center of town and the pre-Revolutionary War Carlisle Iron Works Furnace. In the center of town is the Mid-Atlantic office of the Appalachian Trail Conservancy (ATC). ATC is the overall steward of the A.T. The ATC office has very limited parking. More parking, a portable toilet and A.T. access point can be found nearby at the Fishermen&apos;s Parking Lot at the Carlisle Iron Works Furnace. If you&apos;re hungry, there are several options in Boiling Springs, including Caffe 101, The Boiling Springs Tavern or Anile&apos;s. There is also a supermarket about a half mile up the road from Anile&apos;s.
Option 1: The trail runs along the famous trout fishing stream, Yellow Breeches Creek. Follow the A.T. blazes across Bucher Hill Road, toward the ATC office, then along Children&apos;s Lake. Continue past the gazebo to the Mid-Atlantic Office of the ATC. If you have extra time, cross Route 174 at the ATC office, taking the short trail running between the post office and the Boiling Springs Tavern. There you can see a stream leading to the bubbling waters that give Boiling Springs its name. Then head back to the ATC office. Walk back along Children&apos;s Lake and return to your car. Option 2: If you are more ambitious, start at the Iron Furnace and continue south across the creek. Follow the Appalachian Trail as it goes left across the beautiful historic stone bridge and zig zags through farm fields for more than a mile. You’ll then begin a steady climb up South Mountain. The big holes in the ground are where they dug out iron ore for the foundry a couple of centuries ago. After a one-mile gradual climb you&apos;ll reach the peak, known as Center Point Knob. When the A.T. was first laid out in the 1930&apos;s, this was the exact center. The midway point is now several miles south, near Pine Grove Furnace State Park. Park at the gravel lot by the Iron Furnace in Pine Grove Furnace State Park. Option 1: After visiting the A.T. Museum, follow the white blazes south, past Pine Grove General Store. 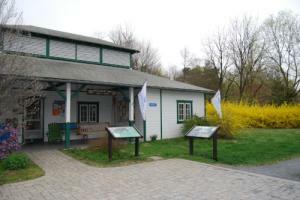 The large building on your right is the newly restored Ironmaster&apos;s Mansion. Continue south on the AT for a mile or two until you see the prominent marker showing the actual midway point of the A.T., where all thru-hikers have their pictures taken. The actual spot changes a bit each year, due to trail relocations. Retrace your route back to the car. Option 2: Get a map from the Park Office. Then, travel north on the A.T. (away from the store and the Ironmaster&apos;s Mansion). Follow the white blazes pass the beaches at Fuller Lake and head down a dirt road into the woods. After a short time, the A.T. will head off the road to the right, steadily climbing another ridge of South Mountain. In less than a mile after you start climbing, you&apos;ll see a sign directing you left off the trail onto the rock outcropping on Pole Steeple. Rather than going back on the A.T., you can go down the blue blazed Pole Steeple Trail. This is a much steeper trip down, so be careful. Take the A.T. back if you aren&apos;t sure-footed or if the weather is poor. If you take the Pole Steeple Trail, you&apos;ll come to a dirt road at the bottom. Go left and in less than a mile you&apos;ll connect up to the A.T. again. Follow the white blazes on the road back to your car in the parking lot. 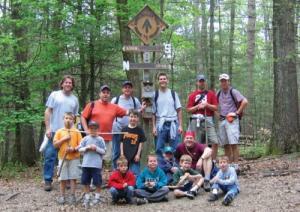 OVERNIGHT CAMPING: Are you interested in overnight camping along the trail? Be sure to register your camping plans at ATCamp.org. A registration is not a reservation, but is a way to ensure a better hiking experience and help you avoid overcrowding at shelters and campsites. PARKING: Find a map and GPS coordinates for parking along the Cumberland Valley PA stretch of the Appalachian Trail. 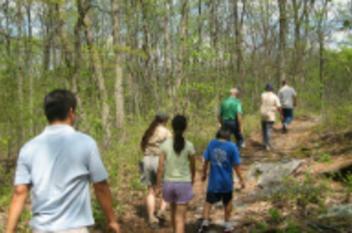 Also, find additional information about the Appalachian Trail here.